"I love the freedom of others," said St. Josemaria, "yours, that of the person passing by right now on the street, because if I didn't love it, I couldn't defend mine. But that's not the main reason. The main reason is this: that Christ died on the Cross to give us freedom, so that we could live in the freedom and glory of the children of God." 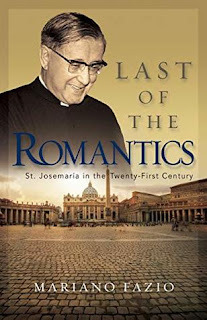 St. Josemaría Escrivá referred to himself as the "last of the Romantics," and under this title Mariano Fazio portrays the founder of Opus Dei as a passionate defender of freedom. As he does so, Fazio offers an orderly, clear, and attractive presentation of many of St. Josemaría's key teachings. These teachings will challenge his readers and hopefully awaken in them the same love of freedom that St. Josemaría bore in his heart. "Don't let me be 'the last of the romantics,'" he would say. "This is Christian romanticism: to love the freedom of others, with love and affection." "With the nostalgic words, the "last of the romantics," St. Josemaría wanted above all to challenge his listeners, to awaken in them this same love of freedom that he bore in his heart. "Don't let me be 'the last of the romantics.' This is Christian romanticism: to love the freedom of others, with affection." With this as the key to our reading, we approach in these pages several aspects of the view of the gospel that God inspired in St. Josemaría: the joy of being children of God, work as a locus of holiness, the positive character of secularity, the importance of family life and of love, the value of pluralism, the social repercussions of the life of each Christian. The author has undertaken this task with an eye to synthesis and accessibility, which ensures a thought-provoking and pleasant reading experience. This book, moreover, takes on a special relevance as we approach the ninetieth anniversary of the moment when God opened St. Josemaría's eyes to this panorama of holiness in the middle of the world." "The book you hold in your hands is not a biography: many fine ones have already been written. Nor is it a theological study-these, thanks be to God, are already abundant as well. Nor is it a simple collection of texts. Rather, it's an orderly presentation of some of the consequences of the light received by St. Josemaría ninety years ago, which remain relevant today. Obviously, the order and themes selected will follow a personal vision. The message is a rich one, allowing for various emphases. 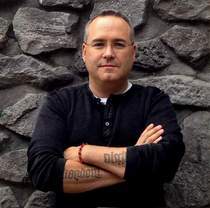 Here we are in the realm of opinion, where, as St. Josemaría would say, freedom ought to reign." "In Part One, we will stop to consider the intervention of grace in his soul on that second day of October-the call to sanctification and apostolate in ordinary life-and the means he used to spread this teaching throughout the world. In Part Two, we'll endeavor to outline some distinctive features of the spiritual life of Opus Dei's founder, following a threefold outline. In Part Three, we will analyze the "places" where we are called to sanctify ourselves: the Church and the world. The next three chapters-which make up Part Four-will address the great theme of freedom as a necessary condition for living out our vocation to holiness. Finally, in Part Five, we will dedicate a few pages to the three basic areas of ordinary life, which we are called to sanctify: work, the family, and civil society." This book draws extensively from the writings of St. Josemaria, how could it not. In fact the vast majority of the conclusion is an extended excerpt from Friends of God 313-314. So some would ask why read this book. And I would say because it is the connections between his writings and talk spanning time that make this book so worthwhile. If Escriva's writings are the meat of the meal, then words of Fazio are the vegetables and gravy that turn it into a magnificent stew. The writing is wonderful in this book. It illuminates passages I was already familiar with and shed new light upon them, their meaning and how to live them out in my own life. There are books that I reread every year. Some I read for a few years and they end up falling off the list. Some like Escriva's own; The Way, Furrow, and The Forge have been read and reread many times. This book will be joining that list. And as such I challenge you to give it a read, you will never be the same.